As those of you who follow me over on Facebook will know, about a month ago, we finally braved it and put the kids in together. Yes, the toddler and the baby are now officially sharing a bedroom. This was always the intention; we live in a two bedroom house so it needed to happen eventually. However given that neither of them had been the best at sleeping it seemed like a foolish move to try too soon. The baby had been taking naps in his cot in the toddler’s room for some time and seems to like the space of the big cot bed and so, after a horrific weekend of being woken up every 45 minutes at night, out of sheer desperation I decided we had to try it out on a more permanent basis. It couldn’t possibly be worse than the status quo. Much to my amazement, it has actually worked out remarkably well thus far. The toddler, unlike me, sleeps soundly through the baby’s brief nocturnal moans, shuffles and short cries, and as a huge bonus has stopped complaining loudly about going to bed now that they have bedtime together. She has also stopped waking up frequently in the night and/or waking us up, and the best news is that we generally don’t hear from the baby until (very) early in the morning. God bless these thick 1950s house walls. It has meant that, contrary to all expectations, I have not yet been able to write an utterly hilarious blog post about the misery that is having two children up all night… but this does not displease me. Feeling a bit cocky perhaps, we got rid of the cot that was in our bedroom. Not just dismantled, but also transported sixty miles away to be put in indefinite storage. The room feels a lot bigger than it has for eight and a half months and I can now get out of bed without smashing my hips on furniture, so that’s a good thing. However it does mean that in the period between 5am and 7ish, when the baby decides he wants to wake up, whinge and then go back to sleep every 15 minutes or so, he has to come back into bed with me. Assuming that a key component of co-sleeping is the sleeping bit, I’m clearly doing it all wrong. As someone who happily co-slept regularly with both of my babies and then occasionally after that when they were teething, poorly or wouldn’t settle (basically anything for an easy life), I still don’t understand how it is achieved on a consistent basis with a mobile baby who appears to have a death wish. 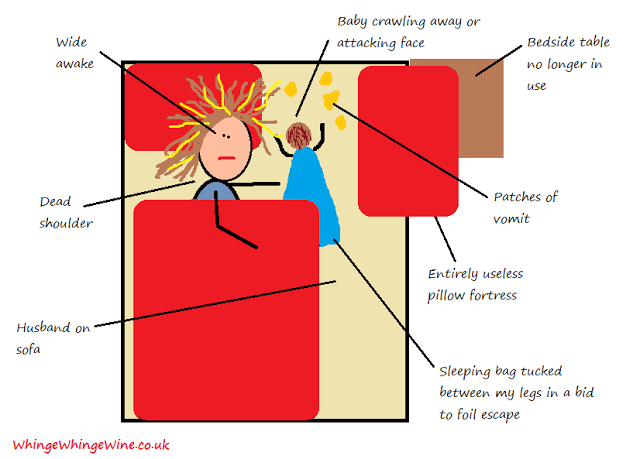 Maybe the co-sleepers among you can tell me where I’m going wrong?! Good luck and may the sleep return soon. I LOVE the diagram!! That makes up for the post you have been as yet unable to write!! I also love the wide eyed expression on your sons face in his photos-he is just too cute!! 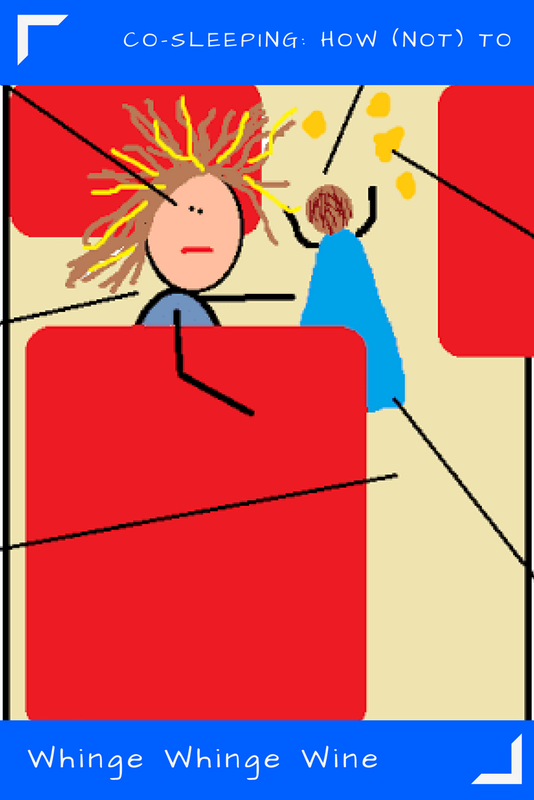 Unfortunately, I have nothing to offer on co-sleeping. I did it for 6 weeks with my first, when he refused to be put down, but I couldn't sleep because I couldn't get comfy with him in the bed! And we soon realised that swaddling tricked him into being put down, and he started sleeping in his basket. The second wouldn't entertain sleeping in our bed!! He went into a cot at 2 weeks because he just wanted to spread eagle, and he hated our bed, and the basket, and slept really well in the cot! Even now if I offer for them to come into our bed, when they're ill etc, they both refuse, which makes me sad, because I'd like them to do it occasionally…! I hope the room sharing continues to be a success for you! I think parent sized cots are going to be my Dragon's Den idea – don't steal it! Sadly, we have succumbed to illness. I knew I had jinxed it! Last night he slept on my head from 2am. Aye, he's definitely cute. They make the non sleeping ones extra cute so you keep them. His absolute favourite position is on top of my head. It's extremely uncomfortable. One day, he might sleep in his own cost until such amazing times as 6.30 am… I can but dream! Thank you! Ah it's great isn't it. On occasion I have the two in (but usually when the bigger one is ill. She isn't a sharer naturally) and my god that's hard work!